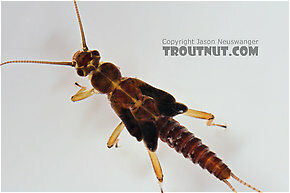 These are often called Forestflies. 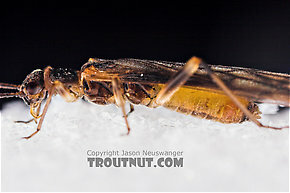 Female Amphinemura (Tiny Winter Blacks) Stonefly Adult View 5 PicturesA few of these tiny stoneflies were among the only species of aquatic insect adults in the air on this particular afternoon, with most of the action coming from a species of Epeorus mayfly. I somehow forgot to photograph this one on the usual ruler, but I recall it was very, very small, with an abdomen no more than 1mm in girth and the body, not counting the wings, probably just 5-7mm long.